Squash Stats Scorer, score a match by clicking on the players Winners and Errors. Maintains, updates match score, stores pplayers stats. 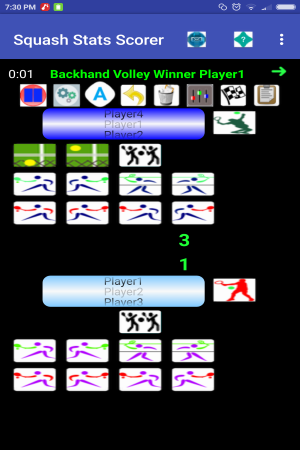 Allows for singles, double, tie break, advantage sets. 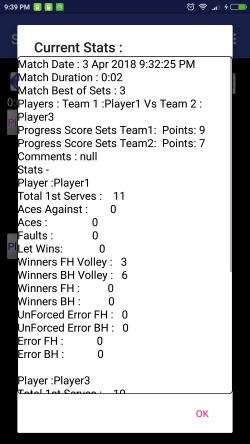 Allows user defined players, Match comments can added, data can be exported and emailed, match progress stats etc. Setup players club player matches, competitions. Can be used as a coaches, trainers aid. Easy to use also contains Media Player. Featuring onLine Radio with 250+ world wide stations, play local device music , videos (mp3,flac,avi etc). Play various Sudoku and Tic-Tac-Toe games.